It’s Friday, so it’s time for another edition of our Friday series for Autism Acceptance month! Acceptance means that not only are you aware of autism, but you appreciate all the beauty Autistic individuals bring to this world. You not only make yourself aware of the needless systemic obstacles Autistic people face because of the systems we have in place–you actively work to change those systems. The awesome thing about this is that you don’t have to–nor should you–take my word for it. Instead, you can turn to people who are Autistic themselves. These talented writers and authors will show you the world through their lenses, across nonfiction, self-help and sci-fi literature. “Sparrow Rose Jones is probably best known for their blog, Unstrange Mind: Remapping My World, and their previous book, No You Don’t: Essays from an Unstrange Mind, both of which deftly narrate their examination of themself, their identity as an Autistic person, and the changing state of access and civil rights for Autistic people. Their essays have covered everything from famous civil rights and criminal cases in the media to sexuality and relationships, life skills, coping mechanisms, and personal introspection. In The ABCs of Autism Acceptance, Sparrow takes us through a guided tour of the topics most central to changing the way that autism is perceived, to remove systemic barriers to access that have traditionally been barriers to Autistic participation in some sectors of society. They also take us through the basics of Autistic culture, discussing many of its major features and recent developments with a sense of history and making the current state of the conversation around this form of neurodivergence clear to those who are new to it, whether they are Autistic themselves or a friend/family member looking for resources to help themselves support the Autistic people in their lives more fully. While it is impossible to capture the full scope and diversity of Autistic communities—and there are many of them out there—this book does serve as an important conversation starter, a primer, and a humble guide to the world. “How do I help my child to thrive? To be healthy and happy, to fulfill his or her positive potentials, and to grow up to lead a good life? Every parent of an autistic child struggles daily with this question. Just trying to understand an autistic child’s actions, feelings, and needs can seem like an overwhelming challenge. It doesn’t help that professional “experts” and the mass media bombard us with all sorts of harmful and terrifying misinformation about autism. Fortunately, more and more parents are discovering an essential source of insight into autism: the writings of autistic adults. Who better to help us understand autistic children and their needs, than the people who have actually been autistic children? “In Authoring Autism Melanie Yergeau defines neurodivergence as an identity—neuroqueerness—rather than an impairment. Using a queer theory framework, Yergeau notes the stereotypes that deny autistic people their humanity and the chance to define themselves while also challenging cognitive studies scholarship and its reification of the neurological passivity of autistics. She also critiques early intensive behavioral interventions—which have much in common with gay conversion therapy—and questions the ableist privileging of intentionality and diplomacy in rhetorical traditions. “Ada Hoffmann’s MONSTERS IN MY MIND anthologizes 49 pieces of the author’s speculative fiction and poetry published between 2010 and 2017, including ten new, never-before-seen pieces. The author’s range is on full display in this collection: the 49 works alternate among traditional short stories, flash fiction, microfiction, poetry, and prose poems, creating a rhythm and flow to the collection as a whole and uniting stories with otherwise multitudinous and divergent content. 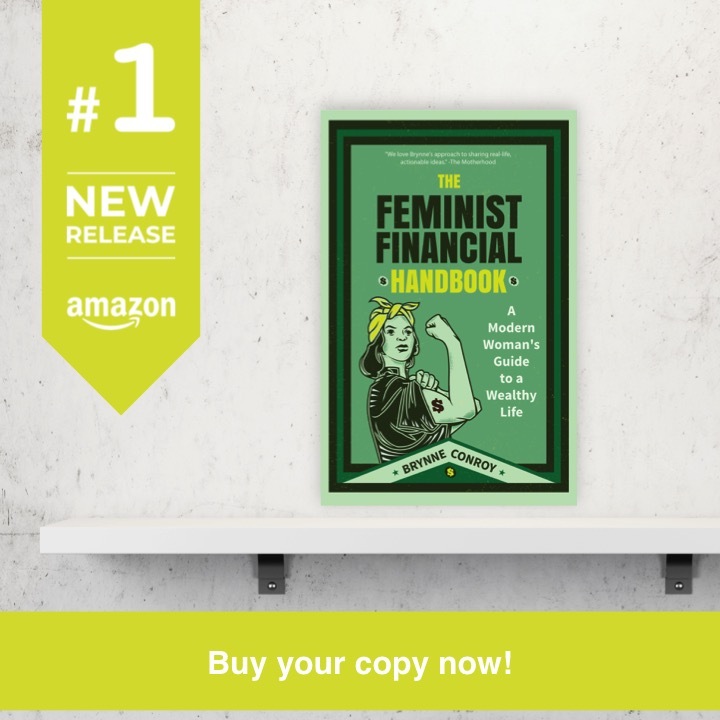 Much of the work is suitable for readers of all ages, although it is worth noting that several stories deal frankly with issues of gender, queerness, sexuality, grief, and loss. Every piece in the collection constructs an immediate and effortless world whose rules are self-evident, although rarely explicit, plunging the reader again and again into an ever-expanding literary multiverse. When it comes to themes, MONSTERS IN MY MIND spans the speculative fiction universe, demonstrating that the genre itself is bound only by the limits of the human imagination, and that its “raw materials” continually reemerge, shift, act, and process in ways few can articulate. The collection is not merely “weird,” as so much speculative fiction is; it is weird in the best ways, weird in the service of, and underscoring the true expansive potential of, the human. By exploring deeply human experiences like loss, grief, duty, love, courage, and loneliness within the context of parallel universes, fantasy quests, reimagined fairytales, near-sentient AI, velociraptors, and the occasional cephalopod, the collection creates a form of access for the reader: a way to approach, understand, and even befriend the monsters in one’s own mind through the exploration of worlds that are vividly different, yet achingly familiar. “When her son reached adulthood, Vonika made the decision to emigrate to Kami, settling in the nation of Temia. In the years since, she’s married a Temian woman, established a distinguished career in architecture, and found the sense of belonging that she, as an autistic woman, struggled to find on Earth. 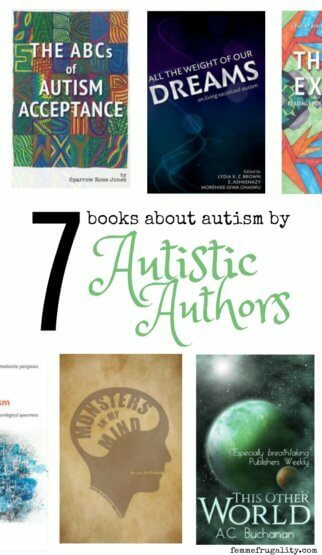 Want more from Autistic authors? 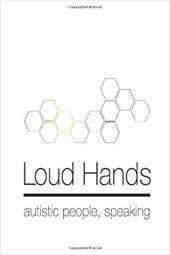 Check out this Actually Autistic Book List on GoodReads! This entry was posted in Think and tagged Autism on April 12, 2019 by femmefrugality.